There has been an abundance of Christmas albums released by Country stars this year, with offerings from Kacey, Rascal Flats and Brett Eldredge amongst others. 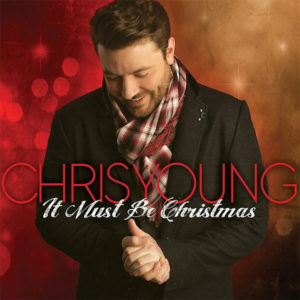 Chris Young has joined the festive party and his 6th album is a Christmas offering. The album is a mixture of old and new songs; he also has some guests helping him out on some of the numbers. As soon as Chris starts with his version of The Christmas Song (originally sung by Nat King Cole) his velvet voice just envelopes you & has you wanting to reach for the baileys, sit down in a big squishy chair, gaze at the lights on the Christmas tree & just let the music wash over you! Christmas (Baby Please Come Home) is also a re make. It was originally sung by Darlene Love and became one of her signature songs. Under the Weather is the 1st of the original tracks. The only thing Chris wants for Christmas is to be snuggled up in front of the fire with his gal. You do find yourself yearning for an open fire whilst listening to this! With There’s a New Kid in Town Chris calls upon Alan Jackson, who originally sung this song with the late Keith Whitley in 1993. Alan is the 1st of Chris’ guests. Their 2 voices compliment each other really well. The upbeat Holly Jolly Christmas and Have Yourself a Merry Little Christmas are next up. Then with The First Noel we have the next guest appearance from Brad Paisley. No Christmas album would be complete without a Christmas carol. Silent Night featuring Boyz II Men is the carol on this album & I have to admit it sends shivers down my spine, it is beautiful, hauntingly so! For the final song, the title track of the album, It Must Be Christmas we have the 2nd original song, again co-written by Chris. It encaptures the true meaning of Christmas with the lines ‘When you give gifts just because And you drive all night only to be near The ones you love’. I was very disappointed at the number of old songs on this album, I would have liked to see more original songs, rather than rehashing old songs. In saying that though Chris’ voice really is very well suited to Christmas songs & he certainly has you feeling festive right from the start. It Must Be Christmas, Under the Weather, Silent Night. 6 out of 10. Too many old numbers for my liking!